PITTSBURGH -- For nearly a quarter of a century, Amtrak's Capitol Limited route has taken me from my beloved hometown to Washington, D.C. Sometimes for fun, almost always for work, the experience is never the same. And if you are a rail lover, it is always about the experience. There is only one train that leaves the Pittsburgh station every day, and that is at 5:20 a.m. (which means your alarm goes off at 3:30 a.m.). Thanks to sharing the line with freight, that almost always means a 20- to 90-minute departure delay. Then there's the nearly eight-hour trip, twice what it takes me to drive there. Flying would only take an hour. So why ride the rails? For starters, there's the joy of looking out your window to swaths of the countryside you'd never see if you were flying over them or cruising along the Pennsylvania Turnpike. There are miles of old industrial sites in places like Braddock and McKeesport, Pennsylvania, some filled with ghosts of the past. If you are curious enough, you look up what they were as you pass them by and learn something new about the cities and towns that built this country, as well as the people who built it. You also see a remarkable amount of them being reused or repurposed as new companies chase the ghosts away. Rebirth among the ashes is the story of America. The post office in Meyersdale, Pennsylvania, is charming. The decay of the old brewery in Smithton, Pennsylvania, is hauntingly beautiful. The rapids of the Youghiogheny in Ohiopyle, Pennsylvania, are breathtaking. So are the sleepy little towns like Hyndman, Pennsylvania, and Paw Paw, West Virginia, where the long-long-short-long warning whistle of the train at each crossing echoes off the mountains that surround these valley towns. What happens inside the train matters as well. One of the true charming parts of the ride is the dining car experience. It isn't just the warm, buttery grits and the crisp bacon. It is the people you meet because of the communal dining. It was there on the Friday before former President Barack Obama's first inauguration where I met African-Americans traveling from as far as California by train to attend his inauguration. From veterans of the civil rights movement to young people caught up in his aspirational rhetoric, we were all sitting, conversing, sharing stories and experiences. Last Monday, when I boarded the train for the first time this winter, I discovered the warm, buttery grits were no longer an option, replaced by a tub of yogurt and granola -- in a box. Dinner now came in a box. So did lunch. Gone were the crisp white tablecloths, and gone were the people who always cheerfully made whatever meal you wanted. My first reaction was: If I were to want to be treated the way I am on an airline, I would take one. I took to Twitter and Facebook to express my disappointment in my best mom tone. A call to Amtrak at first met deflection. As is the norm with spokesmen these days, they declined to talk and tried to insist I put my questions in email. However, persistence, done courteously, sometimes does prevail. Apparently, I wasn't the only objector. Amtrak returned to hot meals by this past Wednesday. The crisp, white tablecloths and the jobs have not returned. In fact, a month ago, employees held a small rally in D.C. to protest the dining service changes and the threat of outsourcing some 1,700 union food and beverage jobs. Change is inevitable. Change is important. But it is often spurred by erroneous assumptions. 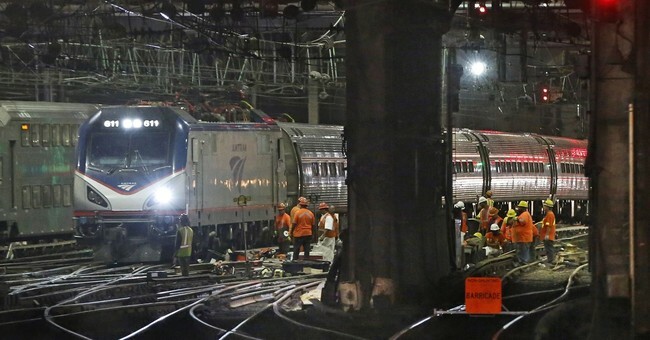 As Peggy Noonan commented on Twitter: "Amtrak's new management thinks trains are planes. A lot of us are on the train because we don't want to be on the plane." Notably, Amtrak's new president, Richard Anderson, is the former chief executive of Delta Air Lines. There are a lot of things about rail service that can and should be modernized. But there are also some that shouldn't. Anderson's next course of action should be a trip around the country by rail to listen to his devoted customers and learn who they are and why they ride. He and his team might realize what shouldn't be changed.